This home exemplifies year-round resort living and is conveniently just minutes to Prospect, Crestwood, and downtown Louisville via I-71. Vacation at home in this stunning 1.5 story brick home on 2-acre lot with your very own sparkling in-ground pool in Harrods Crossing! Your new home features exquisite design accents, including custom hardwood floors, custom moldings, 10 foot ceilings, & marble floors in foyer, and formal dining room. Front and Back stairways are just an example of the many extras in this extraordinary home.The spacious and open kitchen/hearth room area is where you will enjoy many gatherings with family and friends for years to come. Here you will discover a stacked stone fireplace, plenty of built-in cabinets, wet bar with a wine cooler adjoining the kitchen with stainless appliances, including a double oven, granite countertops and travertine backsplash. From here you will be able to access the covered veranda and in-ground pool! Relax in the adjoining great room complete with a fireplace surrounded by marble, custom built-ins, crown molding, ceiling fan, and gleaming hardwood floors. The main level master bedroom offers a tranquil sitting area. Patio access from your new master bedroom will be great for a late-night swim or dip in the hot tub. The en-suite bath features double vanities, black granite, corner whirlpool tub and tiled walk-in shower. Upgrades include new paint & new carpet in the owner's suite, and new paint in the en-suite bath. A living room, study, laundry room, half bath, and mud room finish out the main level. Climb the stunning curved staircase to the upstairs that features a large landing, 3 large bedrooms plus a huge bonus room currently being used as a bedroom. Discover two full baths, one of which is a Jack n Jill between two bedrooms. The upstairs bedrooms have all been recently painted and carpeted. The upstairs hallway and back stairs have also received new carpet. The basement includes a finished area with a family room, gas fireplace, pool table area, exercise area, full bath, and storage space galore. The in-ground pool was installed in 2011 & the depth is approximately 3.5 to 6 feet. There is also a hot tub and expansive patio. Extras include: 2 HVAC systems, two water heaters, security system, irrigation, eave lighting, circular driveway, speaker system on 1st floor, 3 car side entry garage, fencing around pool, and covered grilling porch. 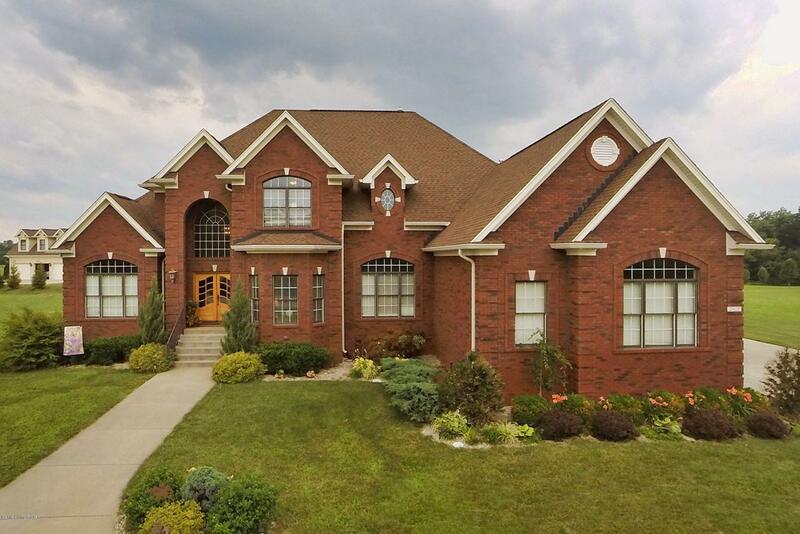 All this and conveniently located near award-winning Oldham County schools, I-71, & just minutes to downtown Louisville, shopping, restaurants, and state-of-the-art medical facilities!